Home » General News » TRINIDAD-Opposition Leader Calls For Fresh General Elections. TRINIDAD-Opposition Leader Calls For Fresh General Elections. Opposition Leader Kamla Persad Bissessar Sunday called for fresh general elections in Trinidad and Tobago after Prime Minister Dr. Keith Rowley fired his Public Utilities Minister Marlene Mc Donald less than 72 hours after she was sworn in as a cabinet minister. “The Prime Minister should understand that the country has lost patience with his incompetence and should now remove himself from office and seek a fresh mandate,” she said in a statement. The last general election was held here on September 7, 2015, when Rowley led his People’s National Movement (PNM) to a 23-18 victory over the ruling coalition People’s Partnership administration headed by Persad Bissessar. A brief government statement issued Sunday gave no reasons for the dismissal of the minister, who is also the deputy leader of the ruling People’s National Movement (PNM). This is the second time within a 16 month period that she has been fired from the government that came to office in 2015. There had been widespread speculation that Rowley had not been pleased with the appearance of a “community leader” among the guest at the Office of the President when McDonald was sworn in on Thursday. The statement said that Prime Minister Rowley had advised President Anthony Carmona “to revoke the appointment of Ms. Marlene McDonald, Minister of Public Utilities with immediate effect. “The President has also been advised that the portfolio of Public Utilities should be assigned to the Prime Minister who will now assume these duties in addition to his other responsibilities,” the statement added. Media reports here Sunday had speculated that McDonald, who had been fired as Housing Minister 16 months ago, had come under criticism after the “community leader,” a euphemism here for gang leader, was present at the swearing-in ceremony. 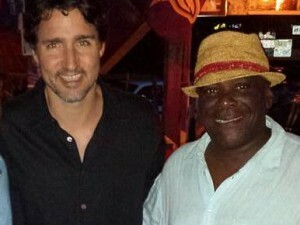 But Cedric “Burkie” Burke, who said he had accompanied another person to the event, told reporters that while he had not been invited by McDonald to the event, he was not involved in any criminal activity in the past. “Whoever has said that I belong to the underworld, I would say it’s stupid, baseless allegations,” he said, adding that “the underworld I know about is in the movies,” he said. In her statement, Persad Bissessar said that the latest dismissal “is yet another example of the questionable judgment of the Prime Minister and demonstrates his unfitness for office. She said that the re-appointment of McDonald” highlighted the absence of capable and skilled personnel available to the Prime Minister. “It took just three days for the Prime Minister’s reshuffle to be confirmed as a misdeal. I expect that in the coming days, more questions will be raised regarding the prudence of other choices the Prime Minister made during his cabinet reshuffle and appointments,” she said, adding “it is increasingly evident that the Rowley regime has collapsed in office”.